Standing…Walking… and double ear infection! Standing…Walking… and double ear infection!. 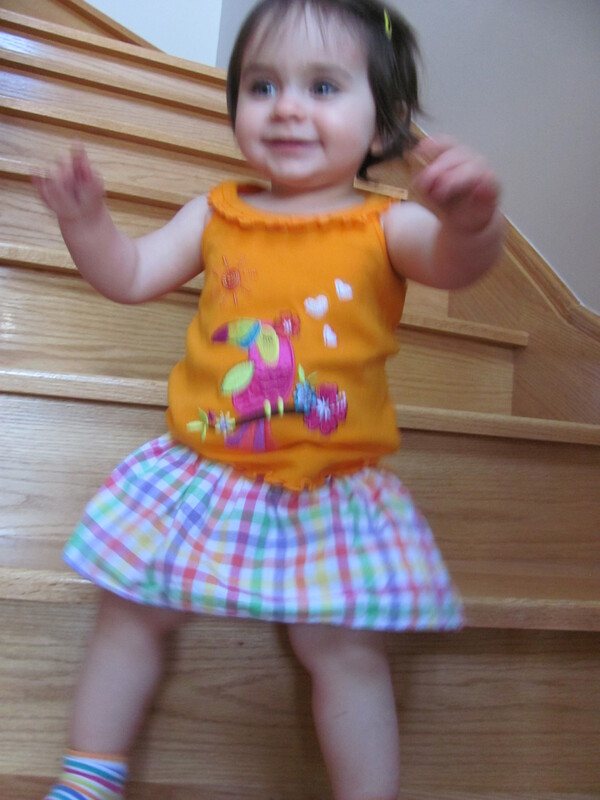 So two weeks ago, on a Thursday, she learned how to stand unassisted. She just stopped leaning and you can see the little face light up with the sudden catharsis that she need not lean/grasp a finger nor climb a piece of furniture for her posterior to remain suspended in the air and for her feet to support her tiny physical form. She was so excited she decided to clap and that caused the sudden gravity pull of her predictable descent in the form of a very comical fall. “Whoosh” and she was down and looking to me to determine whether she should cry or continue clapping. My smile and excitement resonated with her and she continued the self-congratulatory applause then stood again, and again and then again until she mastered it within mere hours. Before I continue presenting her incredible progress of development as noted in the title above, I must share one thing. I adore how she looks to her daddy and me when something happens to see how she should react. For example: the other night, she fell in her crib and doinked her head (gently) on the side of the crib. It hurt, undoubtedly, but she looked at me first to see if there is any need for concern. She is a tough cookie and does not cry easily so I made a mental note of checking her head later but smiled at her reassuringly. She decided that there is nothing to cry about and went on her merry business of playing before bedtime. I now understand the wisdom of not reacting intensely because babies pick up the cues from their parents. This makes me a strong believer that calm parents rear calm children as a result of this instinctual and mutual perception of danger and fear. Back to standing. She mastered the skill then all of sudden she felt the urge to stand all the time! I place her in the playroom to play with her little toy house that requires her to crawl through the door but NO- she stands and wonders why the house is broken because she can’t get through. I place her in her crib to lie down for the night and I return to find her standing in the centre of the crib with a sloppy smile on her face and resolute expression of trying to balance on a mattress. Pretty funny. Next day, my husband sits a few feet across me and I place her, standing of course, between us and he calls for her. The next thing that happened was diapers-commercial worthy! She took one then two steps and fell into his arms. I was flabbergasted even though I was expecting it to happen any day now! He turns her around and sure enough she repeats the amazing feat back to me and falls into my arms. Her dad and I celebrate with clapping and kisses and for a moment she is mystified by our happiness at her new ability. She then turns around while standing and walks over to daddy. This continued for the better part of 5 minutes and then she crawled away from both of us because you know what- that is enough for one day! My feeling of pride at her accomplishment resulted in a silly grin on my face all day. I couldn’t believe that she has finally taken that step in her development (pun intended). The memory of her first steps will be ingrained my memory forever and the feeling of renewal and constant change was a good reminder that nothing stays the same and that we all grow, progress and move forward. It is really bittersweet to see my little infant become a toddler almost overnight. Her independence is increasing and I am astounded by the millions of little milestones that she overcomes through the course of one day. It shames me to think of how much I want her to stay to the same and not grow at all so she can remain my little baby. I mentioned before that my little sunspot does everything in 3’s and this time was no exception. The next day after she learned to walk, she was sick. Runny nose, cranky and pulling at her ears. The following Monday we took her to the doctor and sure enough she had an ear infection in each ear. Oh boy. The misery. We had to give her an antibiotic (which was supposed to taste vile but she shot it back like a pro) and a puffer. It was so disconcerting and utterly upsetting for everyone involved (especially me- I’m just saying). She is now healthy again and walking everywhere. She insists on pushing the shopping carts around the grocery stores and it is quite funny because from the front, it looks like the cart is automatically moving. It isn’t until you see it go by and see this little infant pushing it from behind using the lowest bar of the cart. She also pushes her stroller at every opportunity. Daddy and I always joke that this looks like child labour but really- she wants to do it and I want her to learn too so who am I to stop it? Meal times are messy and her words are increasing exponentially. She understands simple commands and knows when she is doing something wrong because she sneaks. YES, my baby sneaks. She will walk by the entertainment system in the family room and look at me in the kitchen. If I pretend not to see her (she isn’t aware of the concept of peripheral vision yet), she slyly begins pushing the buttons on the DVD player. I will turn and look at her and she will see me, smile and simply walk away pretending she was just going to pick up her toy. The other day she rolled her ball all the way to the corner where her daddy’s PS3 controller was (she isn’t supposed to touch that) and she plopped herself down pretending to reach for the ball. I am sitting reading our junk flyers and she swiftly pushes the ball gently towards the controller and begins touching the buttons on there. I look at her; she sees me, grabs the ball and stands up. Exit stage right! Too funny. I love the fact that she is intelligent and able to form plans to get what she wants. I know I will probably regret saying this when she is a teenager but for now, I am enjoying the harmless manipulation of her environment to achieve results. I feel so blessed to have a healthy and smart baby girl who is finally walking all over the place. She is never left unsupervised and we rarely leave her side when she comes home from daycare but in the odd moments where we are briefly distracted she will rush herself over to the staircase to begin “the climb”. This is a very awkward and life-endangering journey that is full of squealing, knee lifting and banister holding. This is a sport to her and she randomly stops and claps then loses her balance which is why we are always behind her when she climbs. She can’t focus and she is way too happy that she has overcome step number three that she doesn’t realize there are about ten more steps ahead. She also takes weird breaks in between and decides to park the keaster ANYWHERE. She thinks air can carry her for some reason so she just sits. No warning, no reason- madness. Just when I think she has grown so much she grows a little more. Her sleepers are beginning to look like toddler clothes and we had to go shopping for real shoes the other day. They cost $34 but were well worth it. Soft on the arches but leather made so she won’t acquire any rocks or nastiness from the grass/driveway/floor/ground when she walks. I am already tired from chasing her around and she has only been walking for two weeks! I think that this should satisfy any mom’s needs for a cardio workout. I think I saw her yesterday briefly run across her playroom. I was hoping we would postpone the inevitable running until next month but who am I to decide these things? Really.